SNOWSHOES: FROM WOOD TO METAL TO...FOAM? -- See the new Eva snowshoes. THE HISTORY OF CABERFAE PEAKS -- Read the history of Michigan's first destination ski resort. HIGH-TECH SKI SAFETY FOR SKIERS -- The Companion and smartICE apps might save your life on the cross country ski trail. If you're a rock and roll fan, when you head north to ski be sure to stop by Cadillac, Michigan and see the only monument to KISS in the entire world. This magnificent monument is 8 feet tall, 5 feet wide, weighs over two tons, and is one of a kind. It chronicles what many music publications have called one of the top ten stories in the history of rock and roll. Do not miss this great photo opportunity and your chance to show your friends that you are a part of KISStory. 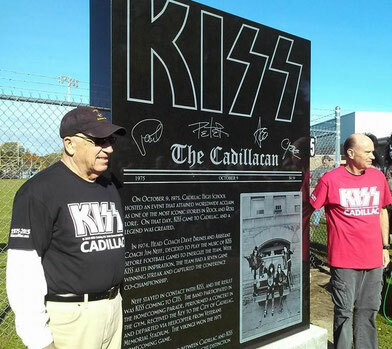 The KISS Monument is located on Chestnut Street across from Lake Cadillac in front of Veterans Memorial Stadium and Cadillac Junior High.